If you were hurt in car accident in or near a construction site in Miami, then you will likely need to speak with a Miami car accident lawyer. Injuries from construction site car crashes can be complicated to resolve. The difficulty begins with figuring out who is at fault because it could be another driver, the construction company, a subcontractor or any combination of those causes. The Wolfson Law Firm offers free consultations with our Miami personal injury lawyers if you were injured in a Miami construction zone car accident. Don’t assume it is all your fault. Never be a silent victim. Let our Miami car accident attorneys fully investigate your construction zone wreck in Miami. We will give you the results of our investigation and provide you with an analysis of your potential for making a financial recovery. Then you make the decision. It is that simple. Just call us at (305) 285-1115 and let us get to work for you. Our Miami car accident lawyers have represented construction workers injured on job site car accidents. These workers have to deal with the weather and often operate complicated machines. There is a lot of risk in working on a construction site. Bad drivers just increase that risk. Miami construction workers are the same as pedestrians involved in car accidents. They are exposed to direct impact and often suffer serious injuries and sometimes they are killed because of the negligence of a driver in a Miami construction work zone. When a worker is injured on the job they cannot sue their employer because of workers’ compensation. But a construction worker can sue a negligent driver or some independent third party who caused their injuries or death. Factually, these cases required an in-depth investigation and expert analysis often involving experts. Our Miami car accident attorneys regularly hire experts to investigate construction zone accidents. 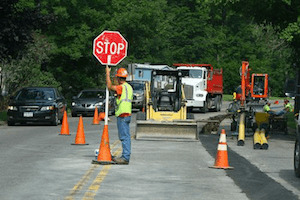 These experts often include engineers, construction zone experts, and accident reconstruction experts. If you are injured in a construction zone accident in Miami you can count on most if not all of the responsible parties to point to someone else when it comes to responsibility. It is the job of our Miami car accident lawyers to sift through all the evidence and opinions to figure out who is liable. Then we can work on getting you the justice and compensation that you deserve. If you were injured in a Miami construction zone car accident, you should call the injury lawyers at the Wolfson Law Firm. Our attorneys have more than 60 years of experience of representing injured people in Miami and we can help you. Our Managing Attorney is Jonah Wolfson. He is a bilingual wrongful death and personal injury lawyer in Miami. Jonah and his bilingual personal injury team are ready to assist you after your Miami construction zone car crash. All you need to do is call us at (305) 285-1115 for your confidential and free consultation. The Miami wrongful death lawyers and injury attorneys at the Wolfson Law Firm serve South Florida including but not limited to the following communities: Edgewater, Miami Beach, Weston, Doral, Hollywood, Aventura, North Miami Beach, Homestead, South Miami, Hallandale, Fort Lauderdale, Wynwood, Liberty City, Hialeah, Miami Lakes, Pembroke Pines and Key Biscayne.